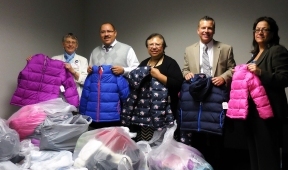 Just in time for the first snow of the year, on Wednesday, November 18th, Westlake Hospital donated 124 coats of various sizes, styles and colors to Elementary School District 89 offices. 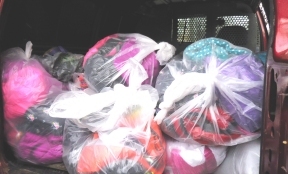 In addition to the warm coats, Westlake also donated two bags full of new mittens, scarves, and hats. It has been an annual tradition for Westlake Hospital staff to organize a clothing drive, which benefits families in need in the community the hospital serves. Westlake Hospital employees began collecting winter coats on October 5th when the weather was still beautiful and it seemed that winter was a long way off. Thanks to the forethought and generosity of Westlake’s staff, at least 124 children in Elementary School District 89 will be toasty and warm this fall and winter. Representing both organizations at the coat delivery were: Janet Lundblad, Chaplain; Dr. Marta Alvarado, Director of Community Wellness Programs; Sandra Ciancio, Director-Occupational Health; Dr. David Negron, Superintendent – School District 89; and David Brusak, Assistant Superintendent of Human Resources.